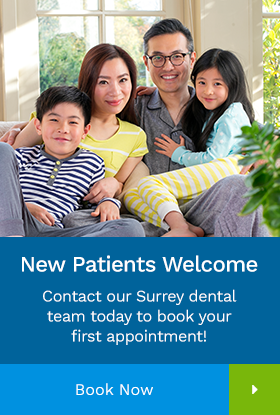 At Elgin Corners Dental in Surrey, we offer dental sealants and fluoride which are two supplementary decay prevention aids, most often prescribed for children. It is important to brush at least twice a day, floss regularly, eat balanced meals, reduce sugary snacks, and visit your South Surrey Dentist on a regular basis. A sealant protects the tooth by sealing deep grooves, creating a smooth, easy to clean surface. The teeth to be sealed are thoroughly cleaned and then surrounded with cotton to keep the area dry. A special solution is applied to the enamel surface to help the sealant bond to the teeth. Sealant material is carefully painted onto the enamel surface to cover the deep grooves or depressions. Depending on the type of sealant used, the material will either harden automatically or with a special curing light.